By following your veterinarian’s recommendations and having your pet tested for parasites annually, you can protect your dog and your family from potentially harmful parasites all year long. Dogs often get parasites at some point in their life. 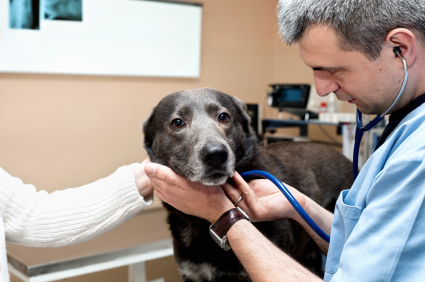 Some dog parasites can infect and transmit diseases to humans. By working with your veterinarian and having your pet tested for parasites annually, you can protect your dog and your family. Also, monitor your dog for changes in behavior, appetite, or water consumption that could mark a problem. 1. DO ensure your dog’s Halloween costume is pet-friendly. 2. 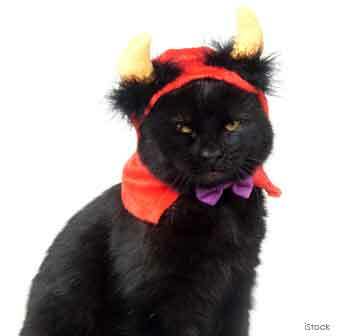 DON’T force an unwilling pet into a Halloween costume. Some pets don’t mind clothing or other holiday accessories, but many do. If your pet is frightened or annoyed by the puppy princess gown or the Darth Vader dog cape, be a pal and don’t force the issue. Let your pet enjoy the holiday, too. 3. 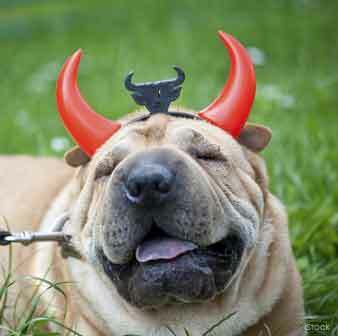 DO closely monitor your pet for signs of anxiety or stress on Halloween. Many dogs and most cats find a constantly ringing doorbell, random shouts of “Trick or Treat!” and people dressed up in weird costumes to be anxiety-producing. Even if your pet seems excited by all the noise and activity, excitement is a form of stress, especially for dogs and cats. 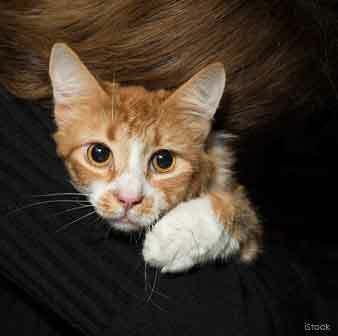 Know when it’s time to remove your pet from the action and tuck her away in a safe, quiet spot in your home. 4. DON’T allow your dog or cat (especially black cats) outdoors unsupervised on Halloween. If your neighborhood tends to be full of trick-or-treaters and fun gatherings on Halloween, it’s a good idea to make sure your pet can’t escape through an open door or window, either to investigate all the commotion, or to escape it. Kitties should probably be closed off in a bedroom or other safe area of the house for the night, and dogs should always be on a leash for trips outside. 5. DO keep all Halloween candy away from your pet. Cats don’t like sweet flavors, so you don’t need to be overly concerned that Fluffy might dive into the Halloween candy. Dogs are another story. Most pet owners are aware of the dangers of chocolate for dogs. But there are other types of sweets that also pose health risks for canine companions, so a good rule of thumb is to keep ALL Halloween candy and treats like raisins, trail mix and grapes out of the reach of pets. 6. DON’T leave candy wrappers where your pet can find them. 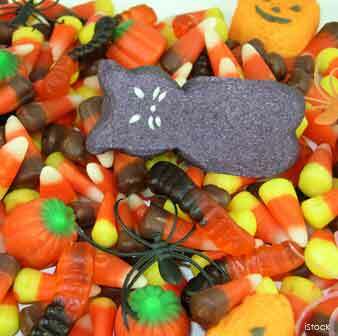 Halloween candy isn’t the only health threat for pets. Believe it or not, ingestion of foil and cellophane wrappers can cause life-threatening bowel obstructions, which often require surgical intervention. 7. 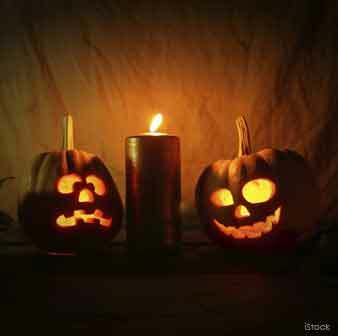 DO place candles — including those inside Jack-o-lanterns — out of reach of your pet. Beware all potential Halloween fire hazards. A frightened cat escaping across a table decorated with lit candles, or an excited dog crashing into a carved pumpkin can spell disaster. 8. DON’T tempt your pet with glow sticks or glow-in-the-dark jewelry. 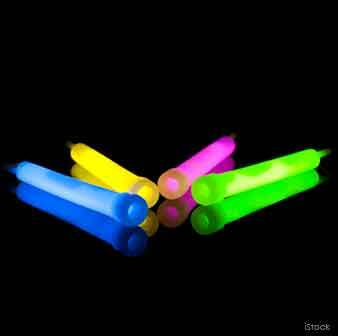 Glow sticks and jewelry have become very popular, and pets — especially cats — have been known to gnaw on them. The substance that creates the glow is phenol, which can leak out and burn your pet’s fur and tongue. Choking on small pieces is another concern. 9. 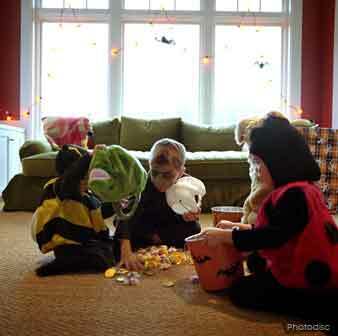 DO set up a safe spot in your home for your pet before Halloween festivities begin. It’s a good idea to have a quiet, safe spot ready and waiting for an overly excited dog or frightened kitty. Make sure there’s comfy bedding, a litter box if your pet is a cat, a few toys, and some “white noise” in the form of a radio or TV playing in the background. Depending on the situation and your pet, you might want to put her in there at the beginning of the evening, or simply keep the spot handy in case you need it later. 10. 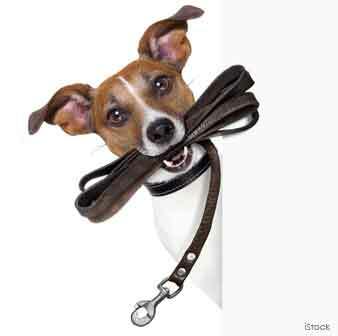 DON’T forget to make sure your pet is wearing an up-to-date collar or ID tag. Even with the best intentions and planning, occasionally pets escape into the night on Halloween. So make sure yours is wearing current identification, and if your pet is micro-chipped, insure your information is current in the chip maker’s database. Niels is sending you a few pictures of our golden dog, Cane, that were taken this afternoon after his bath and grooming. He is sitting in “his” sofa, his favorite place other than on my lap or at the foot of my bed. 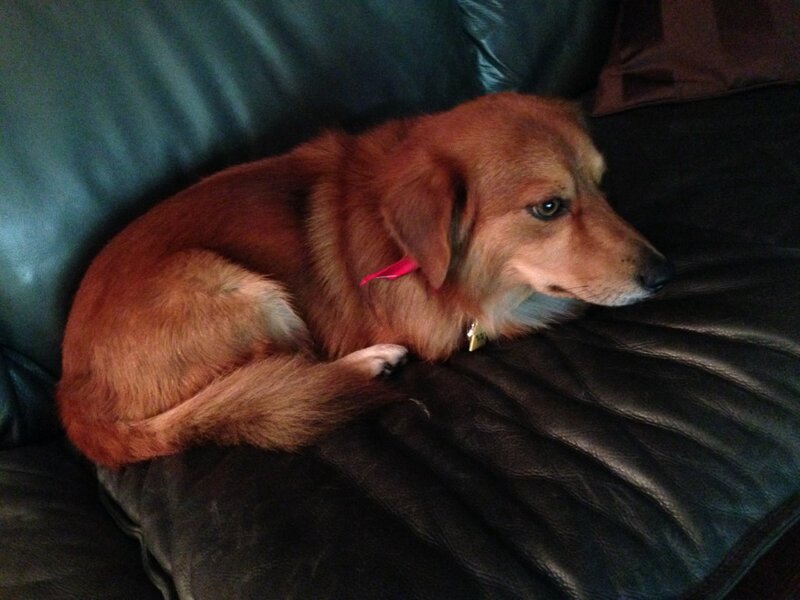 He had a red neckerchief on, which you can see a glimpse of. He has since removed it as it was too informal for his serious demeanor. Cane has clearly established himself as an integral part of our household and keeps a pile of soft toys on the only rug on the first floor. During his bursts of energy, he tosses them about and loves playing “tuggy” with one of us. Then, after a thorough petting and much discussion about what a good boy he is, he settles down contentedly wherever we are. We couldn’t be happier with him. We have renamed Little Tommie to Fitz. 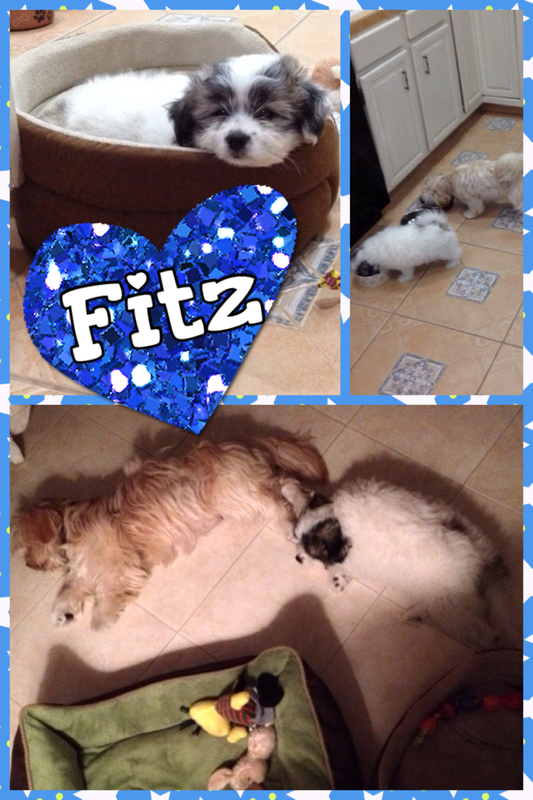 Now we have Fitz & Fiona. 😉 The dogs are doing great together. Fitz has slept through the nights without crying or whimpering. He and Fiona are sleeping side by side in their beds on the floor next to our bed without a problem. It has been about two months since Henry adopted us and it has been so much fun!! This little spit fire loves to go for walks and let us know from the “get go” that he would share the king size bed with us! He and Rosie, our other rescue get along well and he has learned to do his business outside from her! Thanks K-9 Rescue for such a neat little fella!! Animal advocates have long cast a suspicious eye on the practices of the pet food industry – with talk, over the decades, about horse meat, so-called 4-D meat (dead, downed, dying, and diseased), and even the carcasses of euthanized dogs and cats from shelters as hidden ingredients in canned and dried goods. Today, the nutritional content and safety of pet food is a mainstream concern, given the growing consciousness about nutrition and healthy foods and the view that pets are family members. 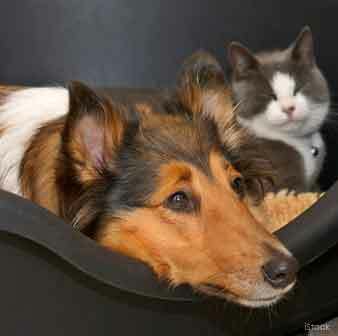 The pet food market has grown dramatically, with some pet food companies even marketing organic food for dogs and cats. But concern over pet food safety may now be at an all-time high, with a series of scandals that have claimed the lives of thousands of animals in recent years, and called into question the conduct and corner-cutting at some points in an often long and difficult-to-trace supply chain. On Friday, the U.S. Food and Drug Administration issued new proposed standards governing oversight over the pet food industry, calling for makers of animal food sold in the United States to develop written plans to prevent food-borne illnesses, like salmonella. Producers would need to put protective procedures into place at critical points in the production process where problems are likely to arise. This much-needed upgrade of the regulatory framework comes as the FDA is still trying to determine the precise cause of a six-year spate of pet illnesses – involving more than 3,500 dogs, with nearly 600 known fatalities – apparently stemming from jerky-style pet treats. This latest food safety scare, while substantial, is small in comparison to the 2007 scandal that ultimately claimed the lives of thousands of dogs and cats. The source then was an ingredient maker in China that added into pet food an inedible compound used in plastics called melamine. A company called Menu Foods, headquartered in Canada, then blended and packaged pet food under dozens of different labels that sickened and killed pets throughout the country. It was that case that provided impetus to Congress to update food safety laws for the first time in decades, enacting the Food Safety Modernization Act and revamping portions of the Food Cosmetic and Drug Act. The FDA’s new proposal amounts to a rule-making, as a partial follow up to the 2010 law that the Congress passed. The FDA and USDA haven’t overcome food safety risks for people either – with the U.S. Centers for Disease Control estimating that 50 million Americans contract food-borne illnesses each year. And these are preliminary steps to try to deal with pet food safety issues. Those challenges are compounded by the difficulty of monitoring production practices in other countries. 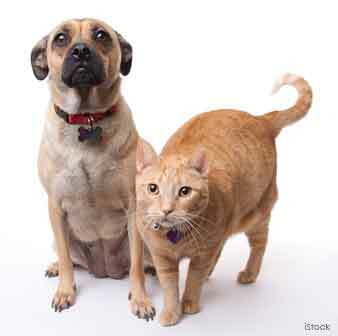 China is the biggest exporter of pet food consumed in the American market. The new rule will be open for public comment for 120 days starting tomorrow, and the agency has proposed it would become effective 60 days after the final rule is made available to the public. However, the agency is also proposing to allow businesses additional time to comply with the rule’s requirements, ranging from one year to three years, depending on business size. We encourage pet owners to participate in this process, and we will be making it as easy as possible for you to do so. Be sure to check my Facebook page in the coming days for information on how you can submit your comments. Ultimately, the best protection for our pets will come from watchful pet owners. They can start with our pet food safety webpage, and sign up to receive our pet of the week newsletter which includes new recall alerts. As a start, be sure to avoid all jerky-style treats. In the end, consumers must demand that pet food manufacturers make it a priority not only to assure safe foods, but also more humanely produced animal products. Given the concerns about pet treats, you might consider baking your own healthy dog treats as a precaution. Baking at home can save you money and be a fun experience for the entire family. Healthy recipes for treats your dog will love can be found at: humanesociety.org/dogs. (NaturalNews) In the wake of yet another wave of animals deaths caused by tainted pet treats, the FDA has just announced new “Preventive Controls for Food for Animals” rules that would, for the first time, establish basis manufacturing standards for pet food. Click here to read the proposed regulations. Natural News readers know that I am usually an outspoken critic of the FDA on issues like drug safety and the agency’s attacks on nutritional supplements and raw milk. But on this issue of dog food manufacturing, I honestly have to agree with the FDA in this context. Today’s pet food manufacturing practices are abhorrent. They are beyond sickening; they’re downright toxic. There are virtually no rules governing pet food manufacturing, meaning almost anyone can set up a dog food plant in a garage or warehouse, and they can pack and sell commercial dog food products even without following basic rules of hygiene and food contamination prevention. 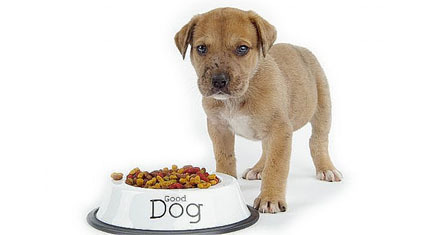 Even worse, consider what ingredients are allowed in pet food products: there are currently no laws or regulations whatsoever that limit the amount of toxic heavy metals, toxic chemicals, artificial substances, fillers or anything else in pet food. Manufacturers of pet food have, for decades, gotten away with selling the most contaminated, polluted, toxic and sickening “food” imaginable (all promoted with happy, healthy-looking dogs and lovey-dovey images, of course). In America, it is currently legal to manufacture a pet food product that kills pets, and there’s nothing the public can do about it. Because of these practices, America is currently experiencing an epidemic of pet cancer and diabetes. Pet diseases are at an all-time high, and just as with humans, much of that is caused by low-quality foods and high levels of food contaminants. It really is time to require pet food manufacturers to meet, at minimum, some basic standards of food quality and manufacturing practices. And even though you know me as a person who prefers small government, there are a limited number of situations where centralized government regulation is actually needed — and one of those is in establishing and enforcing basic food manufacturing standards. I also happen to think that another proper role of government is to establish honest food labeling laws such as forcing food manufacturers to disclose GMOs on food labels. Labeling and food safety issues can only be enforced by a central authority of some sort, because the corporations that make food (for humans and pets) would try almost anything if they could get away with it! I am in favor of government regulation of large corporations which almost always tend to be in the business of lying, stealing, cheating or harming the public. In my view, we need the FDA to lay off small farmers and spend more resources clamping down on big business. This should include pet food manufacturers. This makes sense to me. Remember, our own store engages in food packaging, and we have already undergone USDA organic certification, FDA inspections and county-level health department inspections. I am not opposed to any of these because if we are going to have a relatively safe supply of foods in this country, we do need some fundamental standards to be enforced among those who manufacture and package foods. However, the FDA has a huge problem in that it really doesn’t understand what “safe” food is. In the FDA’s view, the only safe food is a dead food which is why the agency supports so much fumigation and irradiation of food products. What the FDA doesn’t understand is that there are certain types of food — such as raw milk — where living bacteria actually benefit consumers by providing diverse probiotics. The FDA doesn’t understand this. According to the FDA, all microbiology is assumed to be bad by default. On the issue of heavy metals, I agree with the FDA’s position that metals should be minimized in foods. Lead, cadmium, mercury, arsenic and even tin, aluminum and copper can be toxic at levels frequently found in foods. The FDA actively spot checks imported foods for these metals and will quarantine products showing levels that are “too high.” Yet, at the same time, the FDA refuses to publicly release these threshold numbers. What does the agency actually consider to be “too high?” It’s a secret, and they’re not telling. Whatever the FDA decides to do with pet food safety, it needs to be kept in check with both congressional oversight and public whistleblowing in case the agency gets out of line. Yes, these proposed pet food regulations seems to make good sense, but the FDA could go too far and get tyrannical with it. For example, I don’t think the FDA should be raiding pet food plants at gunpoint like they helped initiate with James Stewart, the raw milk farmer from California. That’s clearly an abuse of power. But if the FDA enforces basic standards at pet food manufactures using reasonable application of authority (i.e. warning letters followed by fines and only then followed by more aggressive action if needed), then I honestly think nearly all pet owners in America would be okay with that. If you don’t agree with me on the need for stronger pet food regulations, I dare you to get a job in a pet food factory and see how long you can keep from puking your guts out. Once you see this firsthand, you will BEG for the FDA to nail down some basic guidelines. The stuff that goes on in pet food manufacturing plants should never have to be seen by human eyes. It is beyond nasty. It’s inhumane. So I’m going to keep an eye on the FDA with all this. If they roll out reasonable pet food safety regulations and enforce them in a reasonable, professional manner that prioritizes the public interest, I will support it. If they go “militant” on us and start raiding pet food plants at gunpoint, I will obviously speak out against it.